The “Americanist tradition” has been reproduced in Canada in terms of the structuring of the leading anthropology departments according to the US discipline’s four fields of archaeology, linguistic, cultural and biological/physical anthropology. This is the case with university departments that function as virtual outposts, or bridgeheads, of the US master discipline, particularly at the University of Toronto, McGill University, and the University of British Columbia. 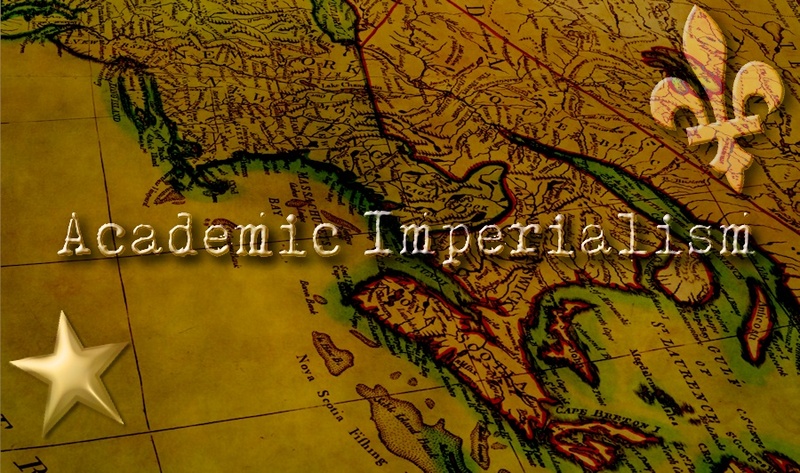 Historically, the departments at these institutions, which garner the bulk of research funding in anthropology in Canada, were staffed by faculty trained at the elite US institutions—the Rockefeller “centers of excellence” mentioned previously. When they host conferences of the Canadian Anthropology Society (CASCA), it appears that to make it worth their while they inevitably have to “partner” the meetings with those of a US counterpart, such as the American Ethnological Society (AES). Such institutions sometimes share staff with US associations, such as the case of Monica Heller at the University of Toronto who is the current president of the AAA, with all of her degrees gained in the US. At McGill, fully 70% of the anthropology faculty obtained their PhDs in the US, and a number of them are US immigrants. At the University of Toronto, among its Graduate Faculty category in the Department of Anthropology, the proportion of US PhDs is 54%, lower than that at McGill, but also because they have tended to hire more British PhDs. At UBC, the proportion of US PhDs in the Department of Anthropology is 48%. I return to the hiring issue below. It should be noted that other, more peripheral anthropology programs in Canada tend to be partnered with sociology and thus lack independent departmental status—there are at least 11 such joint Sociology-Anthropology departments in Canada, out of a total of 47 anthropology programs in Canada. Beyond the structure of the leading university departments of anthropology in Canada, and the composition of staff in terms of their PhDs and the interlocked networks of connections those imply, and the incessant partnering and correspondence with US programs, there is the broader question of the production of knowledge. In fact, it is too broad to be treated in a cursory fashion as is done here. Focusing on socio-cultural anthropology, the dominant mode of producing knowledge is via ethnographic research done abroad. Such anthropology takes its inspiration from an imperial tradition, such as the US’ war and post-war paradigm (because certainly in the 1800s and early 1900s, US anthropology was almost always done “at home,” and only expanded abroad as the US imperial state expanded militarily), or the British colonial tradition. This paradigm has deeply impacted—I would say scarred—graduate students, who often appear ambivalent, regretful, apologetic and somehow ashamed to admit that their graduate research “had to be” done in Canada (usually due to insufficient funding—thus unfairly shouldering personal blame for that too). In terms of the consumption of knowledge, most and probably all Canadian anthropology programs essentially serve a retail function for US-produced and US-published anthropology. This ranges from the core texts that students are required to purchase, to journal articles assigned as readings, to documentary films, and even the study of research ethics. To say that US anthropology in Canada is hegemonic is virtually an understatement. For the most part, Canadian anthropology is actually just anthropology in Canada, and most of that is US anthropology, and secondly British anthropology. What Bourdieu describes is a pattern of subordination and servile orthodoxy, within a national context (France). When translated to an international frame of reference, what this becomes is a process of peripheralization, masked by euphemisms of “globalization”. Canadian scholars ought to understand—from firsthand experience—just how the academic (semi)periphery is created and sustained. (3) that there is academic behaviour that in and of itself and without reference to broader or more encompassing frameworks may be considered imperialistic. What we have as anthropology in Canada is essentially the white, Western, middle-class discipline of an imperial US, thoroughly encoding the social history, political economy, dominant assumptions, and resultant questions and topics of that discipline. Anthropology is primarily an Americanized, bourgeois way of consuming the world. Academic like media imperialism, involves transmitting knowledge, information, meaning— essentially intangible products. Academia both shapes social behaviour, and mirrors certain social behaviours; it shapes expectations while answering to certain expectations. The ambitions and interests found within academic institutions are formed by, and responsive to, the wider political and economic contexts in which such institutions exist. The university is an institution of power, and typically it has served the interests of the powerful. Profit also matters to the university, whether actual monetary profit, or its symbolic equivalents: reputation and rank, visibility and respectability, which are sought as means of eventually extracting profit. Following “best practices” entails the Americanization of non-US universities so that they may be recognized by their dominant US peers as worthy of being seen and thus known. Of particular relevance to Canada is the fact that historically universities have been the key institutions responsible for training the bridgeheads, the local elites in the centre of this (semi)periphery. This has been true of universities generally in the Americas, since early colonial times. In addition, certain academic disciplines were formed with reasons of state in mind—statistics, sociology and the problem of order, anthropology and colonial administration, economics and development. Third World students and faculty are trained in areas of governance, public administration, law, business management, and development, so as to better extend and deepen imperial interests, while accumulating personal rewards for their diligent service. What is presented as “the university” around the world tends for the most part to bear the imprint of the structures of knowledge production—the disciplines—that were formed in mid- to late-nineteenth-century Europe, advanced and then extended by the US. If we follow Galtung’s definition of cultural imperialism, focused as it is on teaching and learning, then the university is the highest form of cultural imperialism. Are Canadian Anthropologists Allowed to Work in Canadian Universities? Of course they are: that would be the immediate response of most anthropologists in Canada to what would seem a very counterintuitive and melodramatic question. They will remind you that in Canada, academic employment announcements always carry the obligatory, legal statement that Canadian citizens and Canadian permanent residents will be given preference in hiring. Within university administrations, there are procedures that must be followed for justifying a non-Canadian hire. Yet, somehow, we still have a large portion of US citizens hired by Canadian anthropology departments, especially in the large urban centres, not to mention university administrations staffed by US personnel—at the same time as we have a high rate of unemployment for Canadian PhDs. Is it our duty to function as a safety valve for rising academic unemployment in the US, when we have only one-tenth of the US’ population? Our total number of universities for all of Canada (population 34 million) is 98—while California (population 38 million) alone has 157 universities. Moreover, has the US ever reciprocated to the same degree, in hiring Canadian citizens in academia? (I am not advocating for a Canadian brain drain; I am merely interested in asking a question about mutuality.) Again, it is impressive to see the extent to which nominally Canadian universities serve to drain capital away from Canada, in order to further US capital accumulation. “But that is why we hired you, so we would have that expertise here to raise the Canadian level up to the US level. If you’re still telling students to go to the US, then you’re admitting your failure. So you should be fired, because you didn’t do your job”. It was an excellent way of turning dependency against itself, by challenging it on its own terms. Nobody—not one single person in an auditorium with about 300 professors from across Canada assembled—rose to challenge her. Let us now turn to some of the striking details presented in that survey, along with some of the testimonials that were recorded by the interviewers. I will only be focusing on those areas of the document that are of immediate relevance to this article. One of the main issues raised by the survey was that, “a survey of departments of anthropology is called for to determine whether perceptions of preferential hiring of non-Canadian PhDs in Canada is based in fact”; on the other hand, a strong desire was expressed to better “include all four-fields” in the association (CASCA, 2011, p. 3). This is not the only time that the document speaks with two voices: a) Canadianization in hiring, yet, b) Americanization of the discipline. There is a schism then between the political-economic and the epistemological, which is a serious problem, since (b) has historically worked to undermine (a). Nevertheless, one of the initiatives which CASCA was required to undertake—and I do not know if it has—was to find an answer to this question: “Are Canadian anthropologists being hired?” (CASCA, 2011, p. 4). Another suggested initiative was to, “Advocate for a Canadian tradition in anthropology” (CASCA, 2011, p. 4). This too seems to have been followed up by silence from the association. There was not even so much as a directory of Canadian anthropologists produced—one of the other initiatives suggested by respondents—which one might assume is a relatively straightforward task of basic importance. A succession of CASCA presidents since then has continued the somnambulist tradition. In terms of the hiring of anthropologists with Canadian PhDs, the survey found that out of 306 respondents (this is roughly half the number of anthropology professors in Canada), 168 had earned their PhDs in Canada, while 138 had earned them abroad. This means that overall 54% of those interviewed had Canadian PhDs. Just over 25% had US PhDs, with the remainder representing PhDs obtained elsewhere. However, as we saw above, these proportions are not the same when we consider the leading, core anthropology departments in the major Canadian urban centres—responsible for teaching the majority of Canada’s anthropology undergraduates (on average for the past decade, 4,000 such students exist in any given year). In other words, the most Canadian programs are the most peripheral—smaller universities, four-year colleges, in more distant and less populated areas, teaching fewer students. Yet another asked: “Are Canadian PhDS being hired in Cdn universities? What do Cdn Anthropology PhDs end up doing?” (CASCA, 2011, p. 23). Another requested that CASCA “track and keep statistics on all hiring practices in Canada” with one respondent making this demand: “CASCA should be advocating for the hiring of Canadian PhDs in Canadian institutions. Or at least publishing the data on how many Canadian PhD hold TT [tenure track] appointments in Canada” (CASCA, 2011, p. 24). Finally, one recommendation was for CASCA to engage in “promoting more Canadian anthropological content in Canadian high school curriculum” (CASCA, 2011, p. 26). What registered with me, from both this document and the discussion in Fredericton, is that there actually is a stratum of Canadian nationalism in anthropology in Canada, especially around hiring practices, and that the problem of foreign hiring is not an imagined one. We each have our anecdotes, and the ones I have collected are not necessarily either more interesting, more numerous, or more important than others. I will share just a little of what I learned: i) when debating whether to cross-list a colleague from another department, one anthropologist felt this should suffice to conclude the debate: “She has a PhD from the University of Michigan”; ii) a Department hires a new colleague whose doctorate is from Harvard, and this person is introduced by name followed by “PhD, Harvard,” which is not a practice used for anyone else; iii) “the quality of my publications speaks for itself” said one anthropologist—but the only “quality” mentioned is that the articles were all published in US anthropology journals; iv) an applicant for a position, coming from NYU, who has just obtained his PhD, is described as “a very big fish”—simply being from an elite US university automatically implies a form of seniority; v) a hiring committee shortlisted four applicants, three of them being US citizens, yet the requirement which the sole shortlisted Canadian applicant did not meet was a requirement that was not applied to any of the US applicants. As a former member of my university’s Joint Employment Equity Committee, when we routinely queried departments about their hiring preferences when they advanced US choices with insufficient explanation, I recall that our queries were sometimes either downplayed or dismissed and the hire might then proceed even without our approval. Rubber-stamping—this incredibly demeaning expectation that as an intellectual you have no questions, ask no questions, and suppress discussion and debate—is one of the routinized cultural mechanisms built into departmental and university administration that ensures continued and even heightened Americanization. One of the underlying arguments advanced in the preceding sections is, simply put, that US Anthropology should be of lesser importance and relevance to Canadians, because it was bred in different circumstances, answered to different interests, and expresses its own dominant culture’s fixations. On another level, Americanization has harmed the employment chances of those we educate and graduate. However, another question that can be raised is—to borrow from Madeleine Albright’s phrase about the US being “the indispensable nation”—whether US anthropology ought to be deferentially regarded as the indispensable anthropology. My suggestion to Canadian colleagues is simple: try living without US anthropology, and keep track of the results. I would suggest from experience that breaking the chains of dependency are nowhere near as painful, difficult, and costly as some colleagues might think. We do not actually need to be members of the AAA, pay dues to that organization, and participate in its conferences. This world, and our own nation, is full of academic associations and conferences, there is no need to develop a fixation with one alone. If it is a matter of building your CV, then surely tenure should give you more reason to be confident about becoming less dependent. We should try as much as possible to use texts written by Canadian colleagues, especially those who are Canadian-trained, and in any case acquire texts from Canadian publishers. In addition, with the weakening of our currency due to periodic commodities crises, this dependency automatically increases costs shouldered by our students. In other words, we need to reduce if not eliminate our capital exporting function as retailers for the master discipline. We must critically question the application of US paradigms, and be wary of following all of the latest theoretical fads of US anthropology, by being less innocent about the powerful interests vested in shaping the directions of US anthropology, and the particular social dynamics at play in how various US cliques formulate solutions to what they consider problems. We should explore the possibilities for a long overdue construction of self-reliant national and regional anthropologies in Canada. Of course, we also need to consider a very basic question: why do we have or need an institutionalized anthropology in Canada? If the answer is, “because others have it,” then we are in serious trouble. We should resist attempts by the AAA to speak for us, and to use Canadian soil as if it was its own territory, let alone furnishing the AAA with its top-most bureaucratic personnel. If we do not even consider such steps, let alone try to practice them, one possible implication would then be that Canada has effectively ceased to have any real meaning, any substance, and Canadian resources can be lightly given away. This increases Canadian alienation, and makes possible a hopeless sense of being without self, one whose primary mission is just to consume and repeat. I would argue that such an outcome violates the very purpose of our work. You cannot continue to tell students that we study “what it means to be human” while training them into servitude, that is, a lesser form of humanity. At the very least, we should always be questioning why we might pay attention to a particular approach, theory, or new topic of interest to US anthropologists, with their many quandaries, cliques and theoretical fads, and examine why certain subjects are erected as worthy of attention and hailed as being of vital significance, over others, and consider the sorts of interests that may be vested in or served by such stances. Is Canadian Anthropology Practical or Desirable? I will not dedicate myself to the impossible task of changing the minds of those who, to begin with, are US-trained and/or US citizens in our country. Their own vested interests are in preventing a discussion such as this one from even happening—worse yet if it should gain any sort of traction. Canadian colleagues have begun to articulate some of the basics of a possible Canadianist tradition in anthropology, being mindful of the fact that Canada does not really possess the kind of unitary, monolithic national identity that we find in the US. This is one of the issues raised by David Howes and Constance Classen in their chapter on Canadian Anthropology (see also Howes, 2006). Many other dimensions are presented in Historicizing Canadian Anthropology (Harrison & Darnell, 2006). What comes out clearly from such efforts is that questions such as what is Canadian anthropology and who is a Canadian anthropologist, are still very much open. For my part, I think that I am at the very beginning of trying to formulate an answer to such questions. While I have been, as usual, lumbering in my labour to arrive at this point, it is also worth remembering that in Canada anthropology’s academic history is relatively recent, dating to the 1930s, but not really emerging until after the 1940s. My own age is older than the history of anthropology at my university, so it is not too late to start broaching such questions after all. The question of what topical interests might be distinctive of an embryonic Canadian “tradition” in anthropology, is one that I have posed to graduate students, although I was already aware of the recurring concentrations of research interests. Their answers came forth with remarkable facility: environmental studies, First Nations, labour, sports, and media/game studies. (However, given the emergence of Native Studies programs, the decolonization movement, and the rise of Indigenous scholars, I have reservations about the continued attempt by anthropologists to dominate Indigenous studies.) The task of compiling and combining the epistemological foundations for a domain of inquiry that is rooted in the histories, cultures, and social formations of the diverse peoples and regions making up Canada, is obviously no simple task, nor is the decision about the methodology for formulating such an anthropology, leaving aside the question of whether Canada even needs an anthropology discipline or whether the very presence of such a discipline is itself a foreign imposition/import. US anthropology had the dubious “benefit” of powerful patrons, politicians, and military personnel setting the agenda of topics that needed to be researched—I do not think, however, that Canadian anthropologists have been given as many clear societal signals (which is not to suggest a complete vacuum). If US anthropology has a distinct presidential history to it, Canada has no prime ministerial tradition in anthropology. This may allow us somewhat more autonomy, as academics, in deciding on what our research agendas, our methods, and intended outcomes ought to be, without however seeking to dictate what may or may not be studied and be legitimately called “Canadian anthropology,” or else the exercise degenerates into a campaign against academic freedom. My tentative suggestion is that we each begin to experiment, and to encounter anew Canadian histories, cultural expressions, political movements, and practices of everyday life in Canada. Some of us have to “re-learn” Canada, and Canada’s history in wider imperial capitalist international relations, in order to be reminded of the kinds of questions and problems that are particular, even if not unique, to us. In terms of experimentation, and in reflecting on my own teaching around “the anthropology of globalization” (an imported subject if there ever was one), I have wondered how the syllabus might change if the only assigned readings I used were ones authored by Canadian academics, or might change even further if from that list I only used the items that were also published in Canada. While the range of choices would narrow, I wonder if there might be a special pattern, a focused concentration, that might arise from such a selection. No doubt the authors would be using the works of the “key [US, UK] writers” in the field—but would they do so in a way that offered a glimmer of an embryonic Canadian sense of sight? Would there be a recurring emphasis or focus of interest that spoke to the possibility of an independent Canadian school of thought on “globalization”? It is an experiment that remains to be done—and let’s be frank, if it were done, it could prove to be a miserable failure. Nonetheless, one of the useful things that an organization like CASCA might undertake, alongside finally creating a directory of Canadian anthropologists, is to solicit publication information from all Canadian anthropologists and compile the publications under specialized headings. That way we could know immediately who wrote what about “globalization,” or any other topic, and the experiment could then become more practical. The Canadian case, with the CSSRC, diverged from the US’ SSRC. One argument is that this was due to the differences between the state formations in the two nations. Canada tended to be marked by greater state intervention in the economy, and with a stronger leftist and populist tradition, in addition to fears of US economic and cultural penetration (Fisher, 1999, pp. 90, 91). If such fears have clearly diminished, it is due in part to the success of “Americanization” and the admission of immigrants who brought with them their pursuit of “the American dream” to Canada. 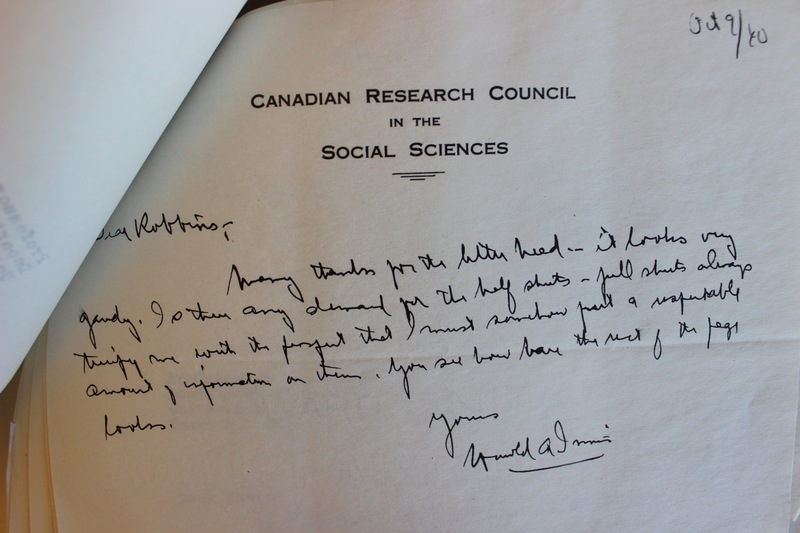 A letter from Harold Innis to John Robbins of the Dominion Bureau of Statistics written shortly after the founding of the Canadian Social Science Research Council in 1940. Photo: Federation for the Humanities and Social Sciences. In terms of anthropology in universities on the North American continent, Canada has been home to the only pronounced anti-imperialist orientation in anthropology, even if this does not apply to all anthropologists in Canada. The only consistent path of courses and publications on the anthropology of imperialism, and specifically US imperialism (explicitly named as such), have taken root in Canada. Though still the overt concern of too few in Canada to be called “a Canadian tradition,” one cannot deny the fact that Canada is the one place where such an approach has found an opening. This and other openings would flourish if more Canadian academics (that is, academics, wherever they may be, who are Canadian citizens, or those born elsewhere who were educated in Canada) committed themselves to the nationalization of intellectual capital. We here in Canada might perhaps not recognize that we do indeed have capital—being drained of it almost immediately, we never get a chance to hold onto it long enough for it to feel like capital. Resource nationalism is nonetheless readily applicable to issues of academic power and academic capital, especially when the Canadian university is supposed to be a public university, mandated to serve the public interest—and that public is only and exclusively the Canadian citizenry. While the nationalism of interest has been lacking for decades, the resources have not: they consist of empirical realities mined and materialized by others, as well as a large body of student learners, professional societies, publishers and publications, and universities themselves. If we had no such capital, we would not have US academics seeking and acquiring faculty and administrative positions (and in my university, US citizens occupy key administrative positions up to and including the university president himself–and these are notoriously lucrative positions). We would also not have US publishers seeking us out through their local agents, to supply them either with prospective manuscripts or with the opportunity to sell their books to our students. We would not have US journals asking us to serve as reviewers for articles submitted to them. Our reviews would not be sought when adjudicating applicants for US grants. We would also not have almost all of the large US academic associations holding their conferences in Canadian cities. The nationalization of intellectual capital involves diminishing the role of Canadian academics (or academics in Canada) as the “salesmen” of empire, turning our universities into the retail outlets for the processed goods of the US. However, an even more daunting yet productive challenge, beyond the political-economic one, is that of developing our own epistemologies and methodologies, our own theories and principles of research—not necessarily exclusive of others and in isolation, nor in toto from the ground up. Without the structures to support such an inquest, that challenge will be met at best by fragmentary, isolated, incomplete and individual means. One of the more interesting outcomes of the Canadian reality of joint sociology-anthropology programs, is that some of them have developed fused, joint introductory courses (such as at Cape Breton University), or joint specializations at the undergraduate level, or bisciplinary graduate programs (Concordia University). A consequence of being compelled to work in that environment, is that I gradually opted to simply drop mention of “enculturation” altogether in my courses—I find that what sociologists have developed under the heading of “socialization” to be far more comprehensive and theoretically advanced, a rich resource for achieving understanding and developing explanations. In summary, the principles here are that our role should not be simply that of buyers and consumers; that we are not here to validate and dignify the sense of superiority and supremacy of others; that this society is not a clean slate on which others can project their fantasies, nor a mere platform for others to exercise their strategies of gain. The call then is for us to reduce our role as importers and amplifiers, spectating on knowledge production as if it were the preserve of a magically-endowed master race. Otherwise, the problematic question will not be what constitutes a Canadian academic, but rather by what right we call ourselves academics at all, if the very essence of our labour—thought—is separated from us and apportioned to those who would proclaim world leadership in academia, and who would hold others answerable to them while never being answerable to the rest of us. Albright, Madeleine. (1998). “Secretary of State Madeleine K. Albright, Interview on NBC-TV ‘The Today Show’ with Matt Lauer, Columbus, Ohio, February 19, 1998”. Archive of the US Department of State. Bourdieu, Pierre. (1990). Homo Academicus. Stanford, CA: Stanford University Press. CASCA. (2011). Report on the Survey of Canadian Anthropologists: Demographics and Opinions of Canadian Anthropologists. Fredericton, NB: Canadian Anthropology Society (CASCA). Fisher, Donald. (1999). “A Matter of Trust: Rockefeller Philanthropy and the Creation of the Social Science Research Councils in the United States and Canada”. In Theresa Richardson and Donald Fisher, (Eds. ), The Development of the Social Sciences in the United States and Canada: The Role of Philanthropy (pp. 75-93). Stamford, CT: Ablex Publishing Corporation. Harrison, Julia, & Darnell, Regna, (Eds.). (2006). Historicizing Canadian Anthropology. Vancouver: UBC Press. Howes, David. (2006). “Constituting Canadian Anthropology”. In Julia Harrison and Regna Darnell (Eds. ), Historicizing Canadian Anthropology (pp. 200-211). Vancouver: UBC Press. Howes, David, & Classen, Constance. (n.d.) “Constituting Canadian Anthropology”. Canadian Icon. Watkins, Mel. (2006). “Harold Innis: An Intellectual at the Edge of Empire”. Canadian Dimension, 41(3). Very important and to the point. I have said very much the same in my autoethnographic paper on the so-called university of excellence. I had the choice between several universities for my PhD, two US, two Canadian. I choose to go to the place where there was a person I wanted to work with: CUNY. As it turns out it was both a fortunate and rewarding decision. I owe my job, I believe, to participating in CASCA conferences as a student where I met people who later were instrumental in soliciting my application for a job at UBC. That said, pragmatically a Canadian who wants to work at a so-called leading research university in Canada is well advised to pursue their doctoral studies int he US. This is not a principled decision, it is a pragmatic and realistic one. The problem is that as long as our US cousins control our departmental hiring practices they will inevitably and unconsciously prioritize people like themselves and degrees from places that flatter their own sense of relevance. Every day in my work place I am constantly reminded that I am a colonized subject, doubly so as both an Indigenous person and a Canadian citizen. Thanks for the link Charles, I will be reading this article either today or tomorrow. I have encountered what I think is a very contrived and unwarranted criticism: that this article is somehow discriminatory against Quebec. There is absolutely nothing here that I can see which discriminates against either Quebec, or a Quebecois anthropology, since the exact same principles of resistance against Anglo-American dominance would still apply, perhaps with even greater force. In addition, when speaking of a Canadian anthropology, I am including Quebec; furthermore, I am also part of Quebec, working as an anthropologist at a university in Quebec. If you can manage to disentangle these two (Canada and Quebec), and produce a version where one opposes the other, then you are reading a different article.